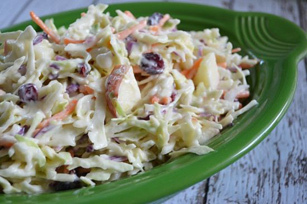 Kick coleslaw up a notch with this Creamy Apple-Cranberry Coleslaw recipe. The fruity combination gives this Creamy Apple-Cranberry Coleslaw great texture. Add MIRACLE WHIP mixture; mix lightly. Substitute raisins for the dried cranberries. Prepare using any other variety of apple, such as Braeburn or Fuji.